Haha, I thought that title was quite funny. Sad to say, the situation with this area of my face is far far far from funny. I've faced issues with acne on my chin since late 2012 and it's been recurring no matter what I do. For a period of time, I was on Epiduo, and it worked really well (refer to post here). However, 6 months later, my acne seemed to get immune and the medication stopped working as well as it used to. Though it was somewhat controlled from thereon, it was never quite perfect or back to the state I wanted it to be. I would actually CHECK OUT people's chins and be so sad about mine... It didn't help that mine was hormonal so people would constantly remind me there was only that much I could do. It looks mostly red here but all the acne is all lumped under. So yes, back to what I said, my chin started to break out and TADA! That is the photo above. Sorry I gave no warning beforehand, but I think we should all face facts that acne is never great to look at. It is what it is, so I might as well be upfront about it. It looks gross, is gross, feels gross. It also makes my self esteem plummet when the rest of my face is somewhat clear and my chin looks like an infestation... So that's when IDS stepped in with Electrocautery and Steroid Injections when I hit my lowest point. 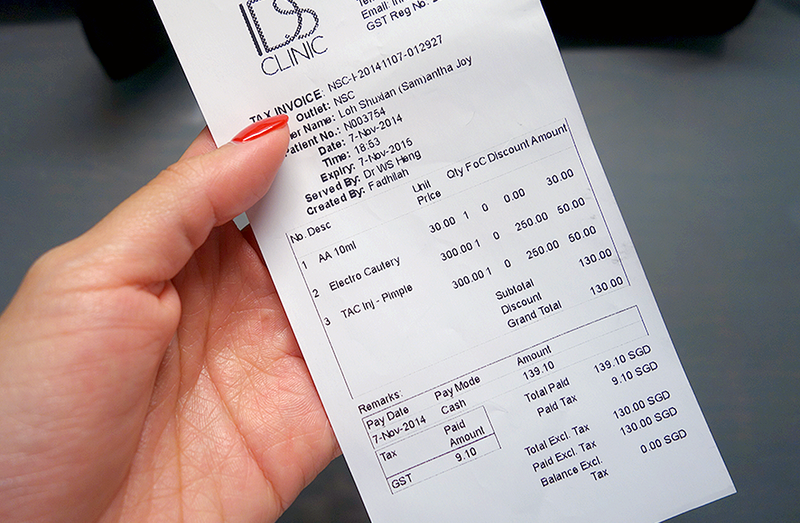 If you'd like to see, Rachell Tan also did this for her chin, and you can read her post here! Just so you know, above is just an example. The injection at IDS may differ, and from my recollection I do not believe the liquid leaked out the same way. You've heard of people who, right before prom, get those really huge nasty pimples on the horizon so they run to a dermatologist to get it injected right? Well, this IS that very injection. Though it is called a Steroid Injection, it isn't actually the type of STEROIDS you might be thinking about (eg. Michael Phelps haahaa). The type of steroid is called Corticosteroid, a steroid hormone which is produced in the adrenal gland, and is a natural chemical which our bodies release in response to inflammation. However, even though our body creates it, it may not always create it quickly enough. Hence, this injection directly injects very diluted corticosteroid into deep papules, nodules or cysts to help soften and flatten them out in a very short period of time. 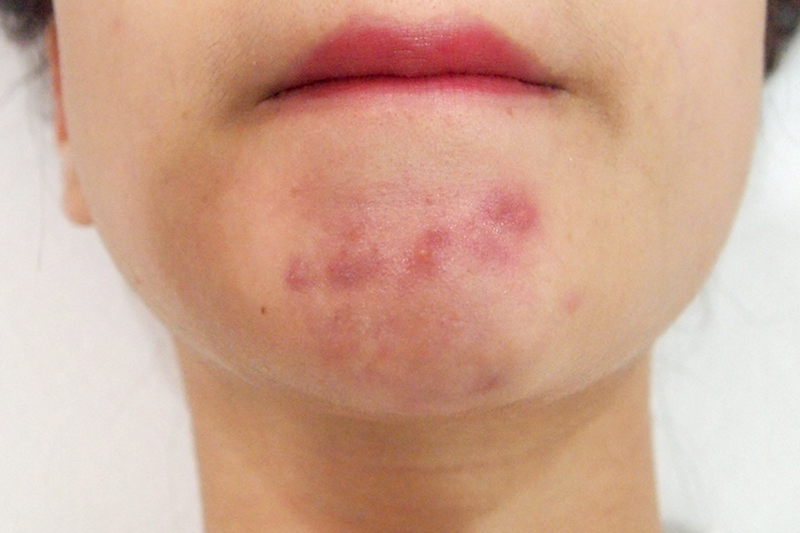 P/S: This isn't a preventive treatment, so it doesn't mean that future acne won't ever appear at the same spot. It just eliminates your CURRENT one. 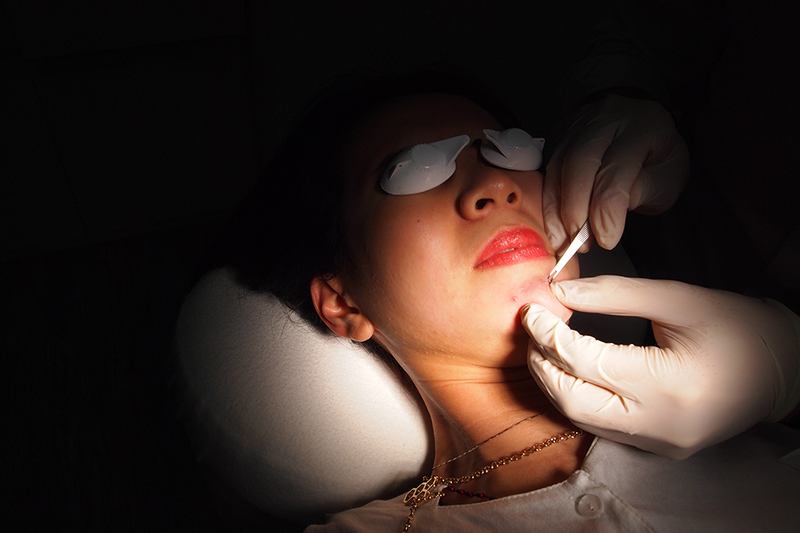 First, they apply numbing cream to your affected areas to reduce the pain during the treatment. Mine was placed on for about 10-20 minutes. P/S: I should tell you, that the pictures below can be A LITTLE gory, so be prepared. Also, my face gets more and more unglamorous, lol. Then I went into the room, laid down, and waited for torture haha. The lights blared on (but there are tiny goggles so you won't see a thing) and Dr. Heng inspected my skin! He was shocked I think, to see such a flare under a more intensive lighting. I had a lot of headless acne, whiteheads and spreading infections. So he went ahead and SHOT SHOT SHOT the places where pus was to be removed. 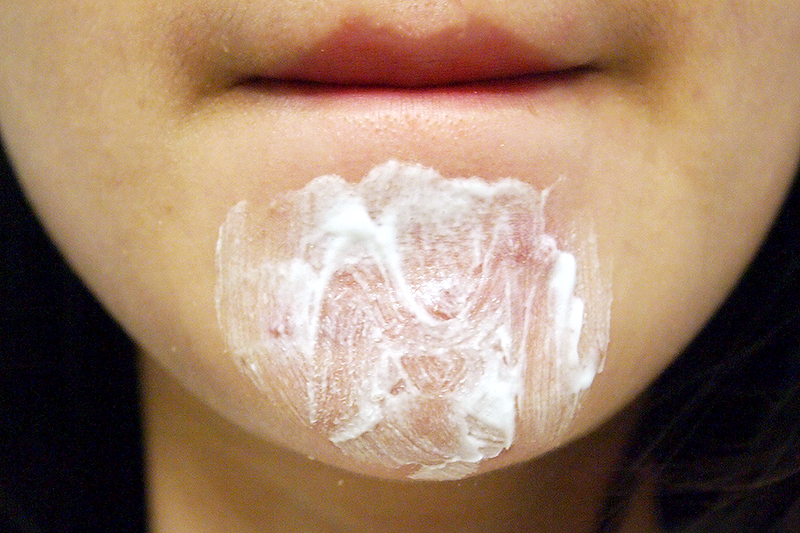 In some cases,stubborn hardened sebum is extracted. For me, it was mostly blood and tears. Blood from chin and tears from eyes. HAHA okay, I kid. As you can see above, they do use a certain apparatus to remove pus/dirt/what have you. Everything is very sterile. Plus, they do it with gloves on so you would feel much safer than having it done outside in some random facial salon. After that was is all done, he selects the more serious pimples for the injections. What I felt was a sharp tinge of pain followed by a few moments relief.. before he moved on to the next one. at the same time, it also felt pretty great to know that all that acne-fighting goodness was going to help me. So once that is ALL done, they pass you a mirror to look at yourself. I half didn't want to, but since I had to head out for dinner, I did. I would rate it as 7/10 for how bad I looked, but hey I went to town and shopped for a bit after and no person stared at me, so I suppose it's pretty okay! On the whole.. its OKAY to go out but if I could've chosen I would've gone home straight lol. If you're going to ask me about pain factor of the whole process, I'm going to be straight up and say 9/10 haha. I won't mince my words. It HURTS. I think I generally have quite a high pain tolerance (or maybe I'd like to believe that lol) and this still reduced me to a whimpering little baby haha. I wanted to die everytime I felt the laser hit my skin or the pus being squeezed out. But oh well, no pain no gain! If you really REALLY cannot take pain, then I think you can request for the numbing cream to be put on for a much longer time. In general it can take from 2 days to 7 days to completely heal, depending on your skin type. I would say mine took about 7 days in TOTAL. As you can see from the photos above, the scabs came out pretty quickly. I never put any makeup on the areas, though you actually can. After all, they're scabs. For me, I just used tinted concealer. Murad/Dr Hauschka have pretty awesome ones if you want to cover up the redness! 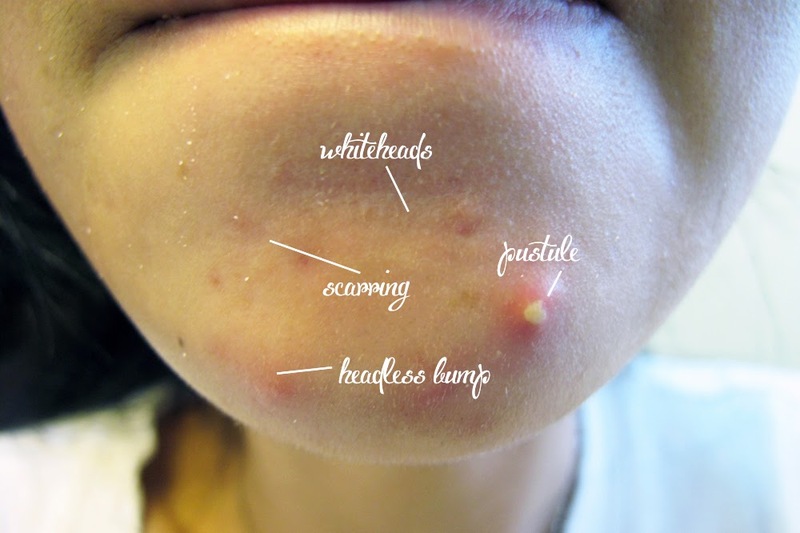 The reason why it took a whole 7 days was because one of the underlying pimples was preparing to come out, so the treatment actually got the horrid thing to show a head and then pop. Scabs itself actually came off at about Day 4! Redness is still pretty much sustained though, so I will assume that's going to take awhile longer to go away. At the very least, my skin is back to being smooth and NOT BUMPY AND PAINFUL! Here is how much I paid for the session plus medication! I changed from Pore to AA because of reasons aforementioned. AA was to help with my huge cystic acne as spot treatment before SPOT! :) Incidentally, both are known as their wonder creams! Whew- that's a lot of money to go into treatment and products, I know. But thus far, I find it worth the pain (literally and metaphorically - referring to my wallet lol). I have to accept the fact that my skin isn't quite the type to take it simple. I've even gone down the route where I do nothing to my skin, since people say less is more, only to still have it end up in a chaotic state. So yes, I do have to resort to this. I am one of those people who, it appears, take awhile longer to adapt to IDS' products and require treatments for my skin to get to the state I want it to be in! As of now, I can proceed to having a facial and see where it goes from here. Hi, can check with you is it the first trial of electrocautey and injection only charge for $100 for both ? Thanks!